Oregon’s offense has undergone a facelift, and the results haven’t been flattering. The once ultra-exciting and innovative unit that produced historically great results now looks ordinary and predictable. Finding something positive in the midst of such offensive regression is challenging, but there has been one resounding bright spot: Dillon Mitchell. The former illustrious recruit from Memphis has become a bona fide superstar. This season, he has been on a mission to embarrass every defender in his path and become one of the best receivers in the game. So far, he’s succeeding. Although the offense as a whole has failed to impress, let’s take a moment to recognize the exceptional season that Mitchell is having and appreciate his historic impact in spite of the underperforming talent around him. The Ducks haven’t found an offensive player to complement Mitchell. The Ducks’ skill position players entered the season with chips on their shoulders. A predominantly unproven and under-recruited group, fans questioned whether they had the talent to consistently compete with the best in the conference. To this point, fans’ concerns have been realized, as the skill position players have not been up to the task. On the whole, the receivers have proven to be a liability, struggling to catch routine passes and separate from even average cornerbacks. The young tailbacks have played like the freshmen they are, missing open rushing lanes and wilting at the first hint of contact. Ultimately, their struggles have contributed to an offensive decline that has caused the Ducks to lose the explosive and exciting identity on which they built their brand not so long ago. But Mitchell is the lone skill player doing everything in his power to keep the flame from dying out on Oregon’s patented offensive attack. Mitchell is a throwback to the Ducks of yesteryear. He’s exciting, dynamic and, most importantly, productive. He has put up numbers 10 games into the year that most players fail to accumulate in an entire season, catching 64 passes for 1,002 yards and eight touchdowns. All three of these stats rank in the top 25 nationwide. 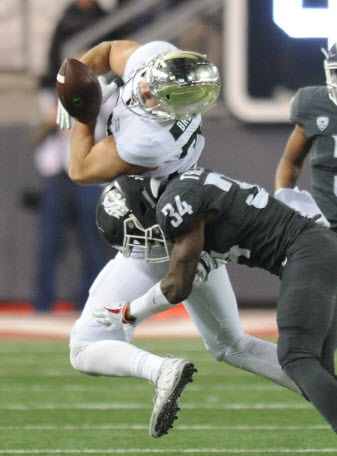 His ascension started last season, when he quickly established himself as Justin Herbert’s favorite target. Mitchell and Herbert kicked things into overdrive at the end of the year following Herbert’s return from injury, and it opened the door for a potential breakout campaign in 2018. This season, they’ve not only picked up where they left off, but they’ve blossomed into a connection that has been one of the best in college football. Mitchell had a career day against Stanford. Mitchell is on a tear and is doing so in the thick of the Ducks’ schedule, gaining over 100 yards in five of his last seven outings — all against conference opponents. When the Ducks need a big play in crunch time, Mitchell is the one they look to, and he has consistently delivered. 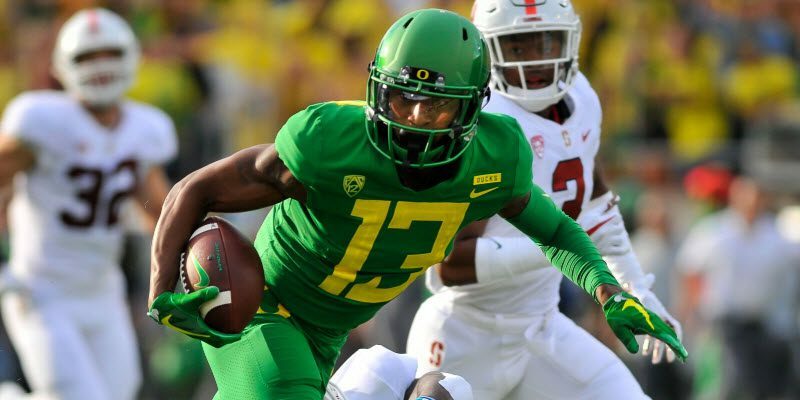 Look no further than perhaps the best game an Oregon receiver has ever had, when the Ducks faced Stanford in one of the biggest games of this season. In the game, Mitchell put together an immaculate showing, catching a staggering 14 passes for 239 yards. It was a masterful effort by one of the best in the business, as Mitchell showed off every skill in his repertoire. He ran past, juked around and outmuscled the dumbfounded Cardinal defense, in what will go down as one of the greatest individual performances in Oregon history. Since then, Mitchell has made the extraordinary seem commonplace, scoring touchdowns and securing drive-saving catches with ease. Even with the extra attention he has naturally drawn due to his emergence as the primary threat in the Ducks’ offense, he has managed to maintain his torrid pace, and he continues to be the Ducks’ best offensive weapon. At this point, Mitchell has his eyes set on the record book. 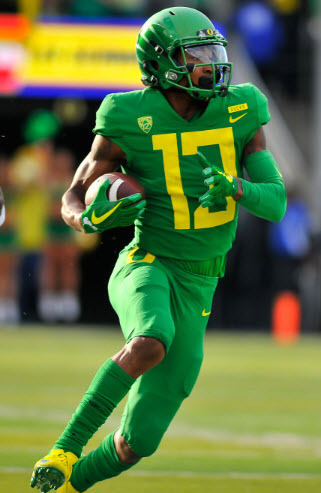 He’s on pace to set Oregon single-season records for receptions and yards, and even the touchdown record is well within reach for the talented playmaker. Reaching these marks would cap off what has been an incredible season, and it would cement his status as an all-time great Oregon receiver. With the Ducks dropping three of their last four games, and the many questions surrounding the direction of the offense, it’s easy to forget that Mitchell is in the midst of one of the greatest individual seasons in Oregon history. Sure, he has not been able to single-handedly salvage what has been an inconsistent and frustrating offense, but he has done his darnedest to do so. The truth is that, without Mitchell, the unit would be far worse off than they are, and his presence at least gives the Ducks a fighting chance every time they take the field. So, let’s all tip our caps to the player who came clear across the country to provide us fans with exhilarating highlights and a much needed glimpse of hope, during a stretch where both have been hard to come by. Bob Rodes, the FishDuck.com volunteer editor for this article, is an IT analyst, software developer and amateur classical pianist in Manchester Tennessee.